A week ago, I wrote about bullet journaling and starting new tasks without expectations of permanence. 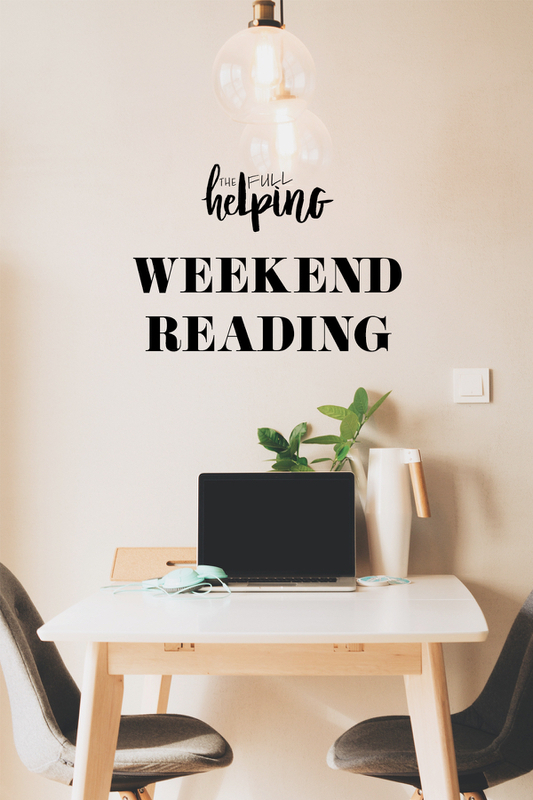 I stuck with a very basic form of the journal through the week, and as I did I started to feel not only a sense of pleasure at having a new way to stay organized, but also the pleasurable experience of feeling as though I was reinhabiting an old self. It was the self who could accomplish ten tasks before noon, who rose with the sun and immediately started doing, who stayed up into the wee hours in spurts of productivity. It’s been a while since I felt like that person. She kept me good company all through my early years of blogging and book editing, through my post-bacc, and through my first year back in New York. She is efficient, driven, and no-nonsense; she has no patience for delays or stopping points. At many times in the past when I felt as though I couldn’t get it all done, she told me not to worry: she was capable of anything she put her mind to. Then something shifted toward the end of the week, on Thursday morning. I woke up inexplicably exhausted and low; I dragged myself through the day aimlessly. I made a list of tasks and crossed off none of them. It was the least satisfying kind of day: not a day of rest or restoration, but not even marginally productive, either. I wish I’d had the good sense to take a few hours entirely off, recharge my batteries, and start fresh when I was ready, but instead I kept trying to call upon my inner productive person to step in and rescue me. She didn’t show up. After hours of waiting for her arrival I threw in the towel and went to bed laughably early. The exhaustion persisted through Friday, and it wasn’t until yesterday that I started to perk up. There’s a lesson here, which is obviously to avoid overreaching and take periods of constructive rest. For me, the lesson is also to let go of my longing for a past self. My inner productivity queen still pays me a visit from time to time, but she’s no longer very present, which may be for the best. She was a helpful ally during a time in my life where I needed to perform, but she had a dark side, too: she was bossy and controlling and a bit of a tyrant. It’s hard for me not to see parallels between the yearning for my hyper-efficient self and moments of ED nostalgia, which I’m susceptible to even now. It’s not that I want to travel back in time and revisit the day-to-day realities or lived experience of either chronic overwork or anorexia: it’s that I miss the sense of power and specialness that came with defying my body’s limits. Manic productivity and self-deprivation evoke the same feeling of superhumanness in me, and it’s an intoxicating sensation. I’m still adjusting to the reality of having needs, of prioritizing my health above what I can create or do or accomplish, and of striving to maintain some sort of balance instead of burning the candle at both ends. It’s a worthy pursuit, one that’s teaching me a lot about humility and the value of slowing down. But it’s not easy, and it doesn’t feed my ego in the way that chronic overextension did. Fortunately, ED recovery gives me a benchmark, as it often does, for how to move forward. Recovery taught me to surrender the part of myself that needed to feel distinctive and superior through food; my current effort to create boundaries around work is teaching me not to take so much pride in being exceptionally productive. It’s instructing me not to continually advertise and declare how busy I am. It’s showing me how to acknowledge my limitations before charging headlong into burnout. Most of all, it tells me that there’s nothing especially glamorous about being so mechanized that you stop taking notice of how you feel. In fact, that way of being is a great way to incur profound human losses: lost interpersonal connection, lost sensation, lost emotion, lost pleasure. I woke up yesterday with big plans to finish a paper and cross a few items of my work to-do list. None of that happened, but I did see Chloe, who’s visiting New York with my beautiful goddaughter, and I celebrated Chanukah with my chosen family last night. At one point in time I might have regarded this as a “wasted” Saturday because I didn’t get anything professional or academic done. Instead, I went to bed feeling more grounded and grateful than I had in days. It’s my last week of the semester, and I’ve got things that need doing this week. But I’m resolved to do them at a sustainable pace. Some projects may need to fall by the wayside, get pushed till after the holidays, or be completed imperfectly. I may need to spread tasks out or migrate or reassign them. It’s alright. As it turns out, I’m not superhuman: I’m very human indeed, possessed of real limitations, and there’s grace and dignity in learning to accept them. As we head into the end of a busy month, I’m wishing you all a healthy sense of balance, self-awareness, and grounded energy. Enjoy today’s recipe roundup and reading links! A simple, seasonal, and vibrant salad to start with. 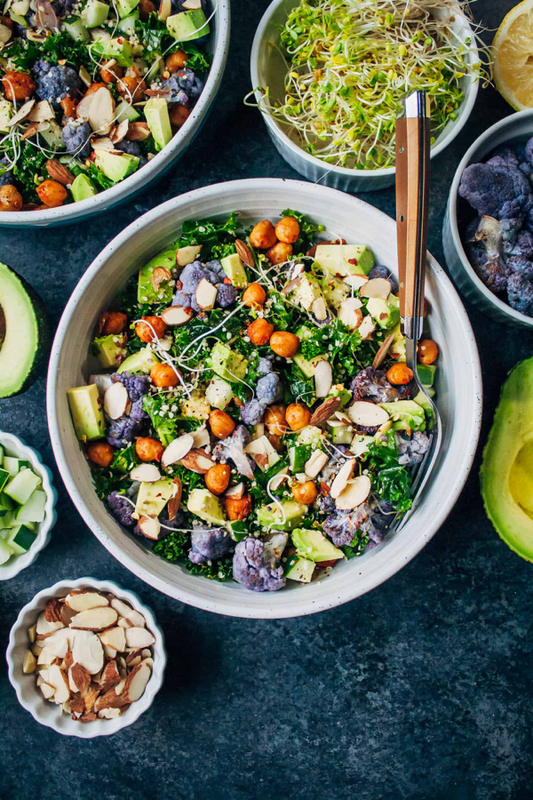 I love all of the color and crunch in Sarah’s chopped kale salad, which includes cajun chickpeas, sliced almonds, hemp seeds, and brightly colored purple cauliflower. 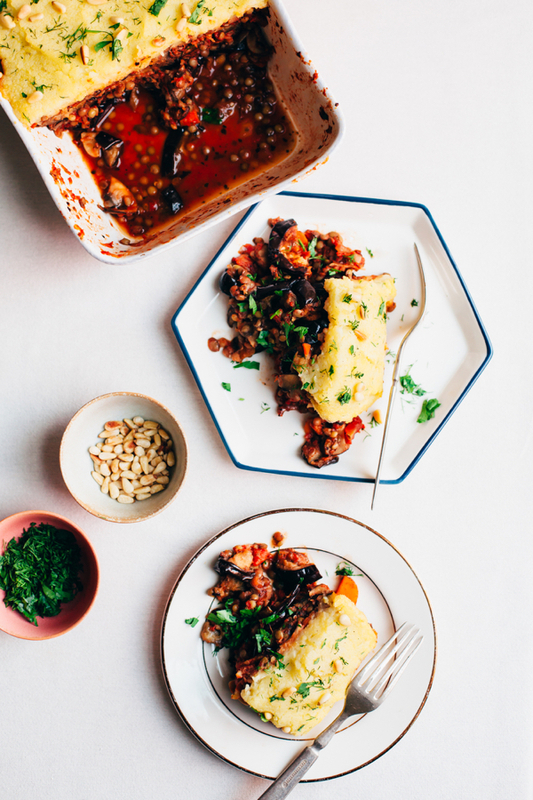 I’ve always thought about how I’d veganize moussaka; the family version when I was growing up involved meat, bechamel, and a lot of deep frying. I’m loving Anya’s beautiful, healthful, and plant-based rendition, which features lentils for protein. 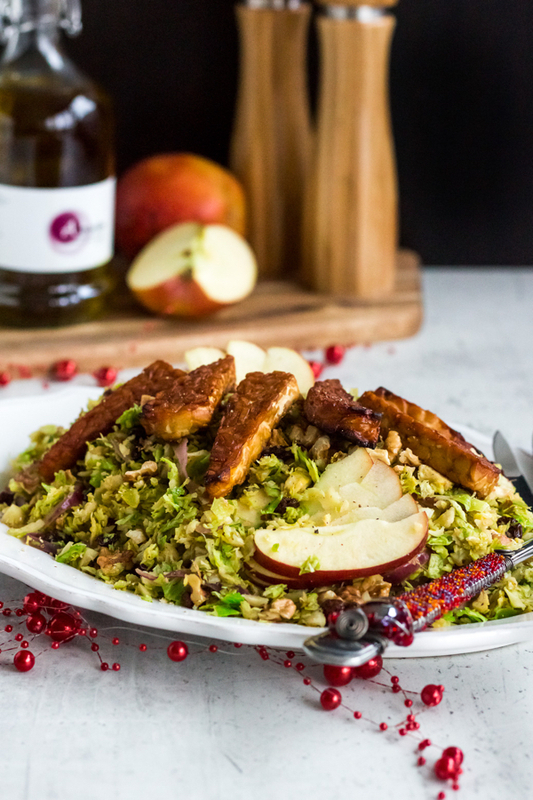 A perfectly festive, holiday-appropriate warm Brussels sprout salad, which also features an orange vinaigrette and smoky baked tempeh. These flavors are right up my ally. 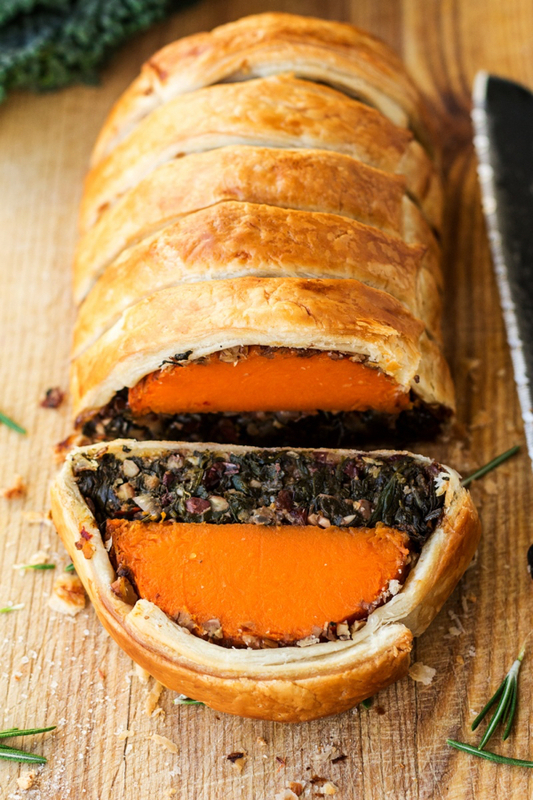 I was so impressed when I saw Ania’s squash Wellington on Instagram, and I immediately went online to look up the full recipe. What a gorgeous, celebratory centerpiece for any vegan holiday feast! 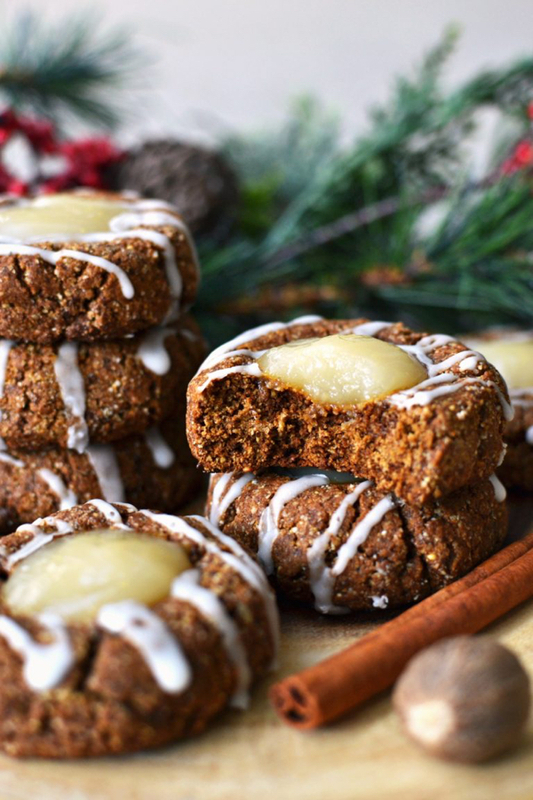 Gingerbread and lemon curd: two things I love, especially during the holidays, but which I’d never have thought to pair up. I’m loving the Rachels’ gingerbread thumbprint cookies. 1. Relationships are as diverse as the people who inhabit them, and universal advice is hard to come by. When writer Mark Manson asked around about what makes a long-term relationship successful, though, he was surprised by the sheer repetitiveness of what he was told. I love the takeaways that he distilled from his interviews. 2. When Tony Luciani’s mother began to suffer from dementia, the artist used photography and photo editing to richly capture memories of his time with her. This post includes many of his images, which brought tears to my eyes. 3. I’d certainly never suggest pushing or forcing any loved one toward therapy, but like the author of this article, I look back on certain moments in my past and wish that friends had given me more gentle urging to seek help (and I also wish I’d communicated to them that I was open to receiving it). 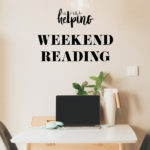 The article shares some good tips on making the suggestion that someone give therapy a try, without forcing or pressuring. 4. Interesting idea: coffee shops forgoing free wifi in order to encourage more communication between strangers. 5. An interesting look at how advances in genetics can help us to better understand how cancers begin—and enable more early diagnosis and treatment. I haven’t posted a Christmas treat yet this season, but tomorrow I’ll be checking in with a vegan and gluten-free shortbread recipe that’s perfect for gifting and sharing. Till then, happy Sunday. Thanks for including us in your post! Have a very merry Christmas! There’s a vegan moussaka in the anniversary edition of Veganomicon (it might be in the original too, I don’t have that). I’m thinking of trying it for Christmas.